Adrien Alexander Voisin was born October 4, 1890 in New York and died May 8, 1979 in California. Voisin first studied as a taxidermist and woodcarver, he was a pupil of Sargent Kendall at the Yale School of Fine Arts. In 1912, he went to Paris where he studied sculpture at the Ecole des Beaux Arts, the Ecole Nationale des Arts Decoratifs, and the Academie Colarossi. While in Paris, he attended the Buffalo Bill Cody Wild West show which began his interest in Indians and the West. 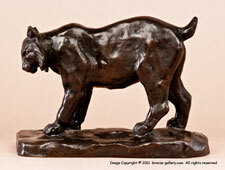 He modeled several Indian busts and small sculptures of wild animals during this time. He returned to America at the start of WWI and in 1929 he lived with the Indians in Montana where he became an honorary Blackfeet tribal member. The next year he returned to Paris where his bronzes were exhibited, winning the Diplome d’Honneur and a Gold Medal in 1932. 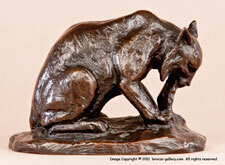 Voisin also influenced three other American Western artists, John Clarke who was a woodcarver, Charlie Beil who sculpted Indians, and Bob Scriver who was only 15 years old at the time but went on to be a well known Western sculptor and painter. Voisin was commissioned to create some monuments of famous people including the large bust of Dr. John McLoughlin in 1933 which overlooks the Willamette River and falls in Oregon. During the Great Depression, he did work as an architectural designer and created several memorable movie theaters including “The Oriental” in Portland, Oregon which had rows of life sized elephants and an idol. Voisin moved back to California in 1933, purchasing an old brewery which he spent 20 years remodeling into a home and art studio. Later he moved to Spokane, Washington where his Indian and animal sculptures were put on permanent display in the collection of the Museum of Native American Cultures. His work is also in the collection of the Denver Art Museum. Voisin’s final years were spent in California where he died in 1979.